As you may remember, I was fortunate enough to receive a shipment of some new no/low fat treats from Unilver (Breyer's, Popsicle, Klondike, etc). Unfortunately, the -100 degree dry ice was not gentle on the Fat Free Cookies & Cream. The cookie pieces became hard as rocks and made judgement of the ice cream very difficult. Yesterday after the cleaning, I finally picked up a fresh container. I've been dieing for some good chocolate ice cream all week long. So, we went with the early afternoon ice cream break yesterday. I dig in and am shocked by what I discover. Nope, not more hard frozen chunks, those are fine now. Actually, I'm shocked by the flavor of ice cream itself. Funny, I didn't really notice it last time, the rocks must have distracted me. It totally has that no fat funk to it. I'm sure I will still eat it, especially since I try not to load up on the high-fat stuff right before bed. Something like this can be a no fat alternative, at least til I pick up a better tasting low-fat alternative. On Second Scoop: or would that be fourth scoop? anyway, yeah, the fat free funk is unavoidable. It's not awful, but I just can't recommend it. 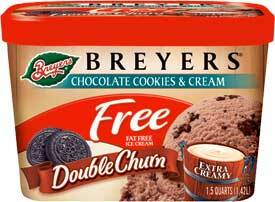 I'll stick with the low-fat Breyer's instead.